It's festival season in Derbyhsire Dales again. This time with a difference: over the weekend of 3-6 August, more than 30 bands and DJs will be playing at Y-Not Festival near Pikehall just off the A5012. National and international bands and great local talent will be hitting the open-air stage with indie rock, reggae, pop, country, funk and dance tunes. One of the most exciting bands to make the bill are the Essex band "Koopa". Last January, they made chart history with their hit "Blag, steal and borrow" by becoming the first ever unsigned band to get a national top forty. 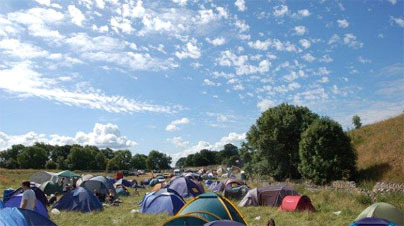 Organiser, Ralph Broadbent, said, "Everyone can have a great time at Y-Not. We've really pulled out the stops this year to make sure it's another weekend to remember". To prove it, Y-Not has expanded on the acoustic acts to include a marquee, comedians and films too, something for every mood. Current plans will see live bands perform from around 14:00 to 23:15 and the party will carry on into the early hours with a disco until 01:30. For tickets and the full line-up, visit www.theynf.co.uk.